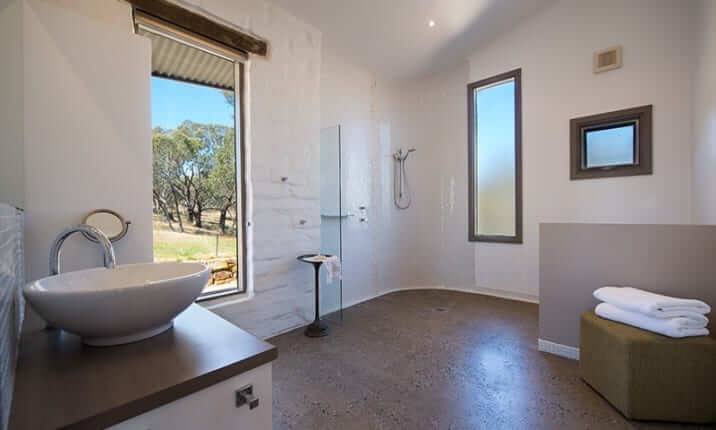 Lithia Guest House is a bespoke mud brick property featuring 2 bedrooms and 1 bathroom. Situated amongst picturesque bushland. For even larger groups you can book multiple properties with our ‘Group Stays‘ option. We can create an accommodation package to suit your needs. Call us on 03 5348 2008 for more information. This breathtaking mud brick home with unique architectural vision is set on 8 acres of tranquil bush. Lithia Guest House is a dream property in a dream location. Sleeping up to 4 guests across 2 bedrooms, this home is situated on an olive grove just five kilometres from Hepburn Springs. Lithia Guest House boasts an open-plan interior across two levels, illuminated throughout by natural light. Inspired in its design, the interior of the home offers north-facing views of the gorgeous Shepherd’s Flat, some of Victoria’s most vibrant bush land. An elliptical wood burning fire on the ground floor invites guests to gather round on a cold winter’s night to enjoy the warmth, as well as the views from the lounge. Eclectic furnishings blend a clean, modern aesthetic with a countryside feel. Exposed wooden supports and bespoke, rustic doors complement the sleeker design elements. Colourful rugs pop against the clean white walls, adorned by lovely artworks. 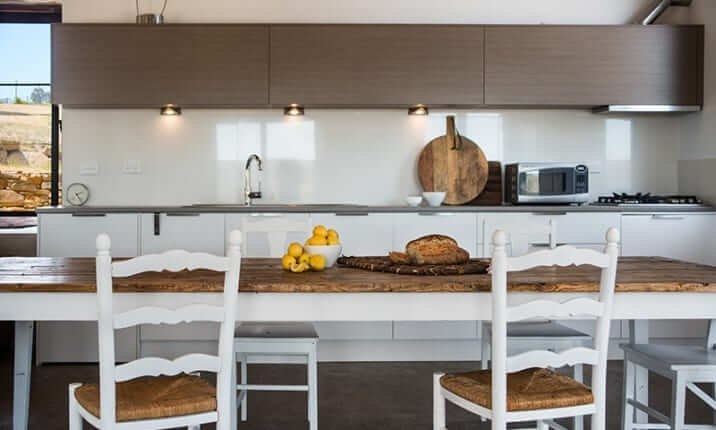 A modern kitchen brings all the comforts of home, with the charming dining table within arm’s reach. The adjoining lounge area offers large, comfy couches and a TV, though many prefer to simply enjoy the sunsets. Stairs lead up to the mezzanine level, where the master bedroom can be found. Both bedrooms offer striking views of the country and welcome in the natural light. Like the rest of the home, these rooms are fashionably furnished and beautiful artworks are mounted on the walls. One offers a king bed, and the other a queen. Similarly, the bathroom is appointed with both quality and style, and features a walk-in shower. A spacious property with two stories, the guest house offers views all around of the rolling Victorian countryside. The Hepburn Springs area offers much to explore, including its famed mineral springs and the Hepburn Bathhouse & Spa. The surrounding region has much to offer, particularly the restaurants, galleries and wellness centres of Daylesford. Lithia Guest House is perfect for those seeking to enjoy an idyllic country getaway with a luxury feel. The property also boasts a walking track, great for exploring all 8 acres of the land on which the house is set. Lithia Guest House offers a simply unique holiday experience, marrying the classic rural retreat with the utmost in design and comfort.